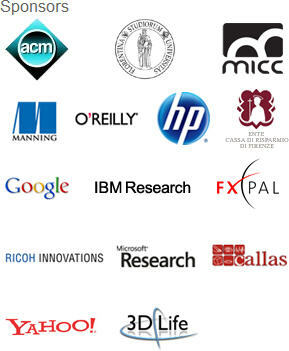 The CALLAS Consortium is sponsoring next ACM Conference which will take place in Florence (Italy) on next 25-29 October. The conference is a key event about Multimedia scientific achievements and innovative industrial products and it will host sessions, tutorials, panels and discussion meetings. The program includes also an Interactive Art session offering opportunity of interaction between artists and computer scientists and investigation on the application of multimedia technologies to art and cultural heritage.